The Friends of Aztalan State Park are an active group dedicated to the promotion, upkeep, and enhancement of a unique ancient Native American ceremonial and residential Native American town established in 1050 A.D.
Driftless Pathways has produced its Final Report for design of interior exhibits for the planned Visitor Center. You can view or download the report by clicking on the image below. WARNING: This is a big file - 353 Mb. The final report on the first ever remote sensing project over the ancient town of Aztalan that provides details of what major archaeological features still lie underground. The project was conducted by Ohio Valley Archaeology, Inc. in cooperation with the University of Wisconsin-Milwaukee, the University of Wisconsin-Madison, Wisconsin DNR, and the Friends of Aztalan State Park. The full report, plus images, can be accessed here. Wisconsin State Parks: Extraordinary Stories of Geology and Natural History. An extraordinary overview of Wisconsin's natural history, from ancient sea beds to volcanoes to glacial masses, over millions of years. Written in a style that is accessible to everyone, author Scott Spoolman shows how the current Wisconsin landscape developed from eons of geological upheavals and weathering. 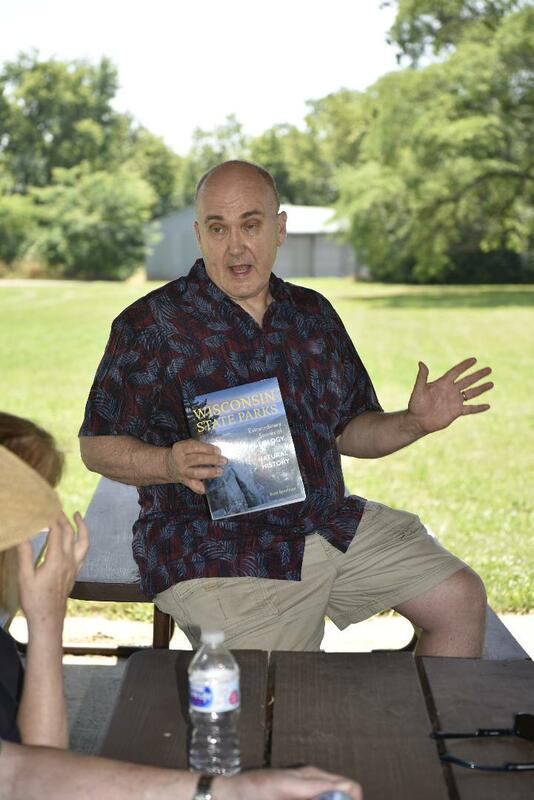 The book, which includes a chapter on Aztalan State Park, is available for sale at the park trailer. The Friends of Aztalan State Park are an active group dedicated to the promotion, upkeep, and enhancement of a unique ancient Native American ceremonial and residential Native American town established in 1100 AD. More Information on joining the Friends of Aztalan, volunteering, and our activities. Donations for the Aztalan Visitor Center are greatly appreciated and will contribute to its success. All donations are tax deductible. Join the Sun People Club with a donation of $1,000 or more. Donate to the Friends of Aztalan Visitor Center using our secure online form. A small percentage of your purchases at smile.amazon.com will go toward educational activities at the park. Click the box below and select Friends of Aztalan State Park as your designated charity. Click the Seal below to see our nonprofit report on GuideStar. You can also donate to the Friends by clicking the Donate Now button at the top of the page. In September 2014 The Friends of Aztalan State Park awarded the RFP for initial design of the Interpretive Center. In July 2015 Dimension IV Madison Design Group submitted its final design report. In 2016 The Friends of Aztalan State Park solicited ideas for the design of interpretive displays in the Interpretive Center. 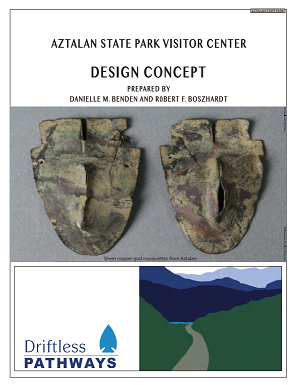 In 2017 The Friends of Aztalan State Park sent a RFP for interior design of the Interpretive Center. In 2018 The Friends of Aztalan State Park awarded the contract for interior design of the Interpretive Center to Driftless Pathways. The Friends will also be hosting fund raisers to provide funds for the remaining phases of constructing the Interpretive Center. See the Events page for dates and places of upcoming fund raisers. This is an exciting new milestone for the Friends group. Interested parties will be invited to participate in in-person and on-line discussion and survey sessions to help make this project a success. Check back often for information on how you can participate in these sessions, and to follow the progress of our efforts to bring this project to fruition. More Information on Interpretive Center. Mounds on Ridge above the village. All events at the site are free unless otherwise noted. May 19. Spring Tour. Visit locations mapped by the geomagnetic survey. June 21. Summer Solstice. Watch the sun set from atop the big mound. Fund Raisers will highlight recent discoveries at the site, including the geomagnetic survey map. Check later for dates and details. May 20, 2018. Spring Walking Tour. May 30 - June 23, 2017. Excavations at the park. June 16, 2017. Organized tours of the excavations. June 21, 2018. Summer Solstice celebration at the park. In conjunction with the Lake Mills-Aztalan Historical Society annual Aztalan Day festival. August 19, 2018. Aztalan Picnic, with Native American food samples. August 19, 2017. Native American Day. Omeyocan Dance Group. September 24, 2017. Annual Field Trip to Trempealeau Mississippian mounds and Perrot State Park museum. Tours can be arranged for adults and schools. Call Bob Birmingham at (608) 241-4958 or email birmi@sbcglobal.net for more information. Printable copy of the 2018 Calendar of Events. May - mid-June, 2016, and Mid-May - June 27, 2017. Further excavations of the ancient structures in the residential area at Aztalan. More information on the Fieldwork Blog. Information about the Schroeder Archaeology Lab. Excavated ancient structures in the residential area at Aztalan and conducted GPR and Magnetometry in areas where the techniques haven't been used before. More information here. Sunrise over the mortuary mound. August, 2017 Native American Day - Omeyocan Dance Group. There is no fee to participate in Friends activities (unless noted otherwise). But because Aztalan is a state park, a fee is required for vehicles. Click here for the list of fees (DNR web site). A Video, 'Aztalan', was produced by Wisconsin Public Television for the Friends of Aztalan State Park. An audio tour and a podcast are also available. These can be viewed and downloaded from the DNR site. A Walking Tour Guide is available at the park. You can download a PDF copy here.